Why Raise an SSD Puppy? Meghan is one of our puppy raisers. She and her husband Kyle raised SSD London, who was just placed with his partner in October, and they are currently raising SSD Garnet and SSD Slider. 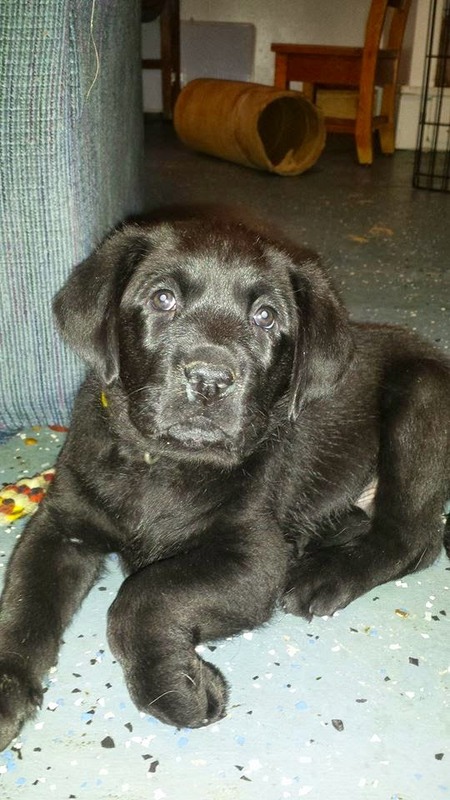 Sharon Medford, another puppy raiser, received her first “little pudge” SSD Uncle Cameron just over nine months ago. “The best part about raising an SSD dog is watching them grow and learn, turning into an amazing dog that will change someone’s life,” she says. We have 103 dogs being raised in our program right now, and we’re continuing to grow. That means that we’re going to need many more puppy raisers to train our puppies, love them, and give them the solid foundation of skills that they’ll need to be service dogs. Our puppy raisers come from a variety of backgrounds. Some have years of experience with dogs, others have never really been around them. They live in houses, apartments, and row homes in the city, in the country, and in suburban neighborhoods. They’re single individuals and families, some with kids and some with all kinds of pets. Shanne raised Lagoon, who was discharged, and is currently raising SSD Grantville, who is in advanced training. Kelly Slabonik wanted to do something together with her daughter so she could learn the joys of giving back. She says, “At first I didn’t think I could give up the dog, so I started as a sitter. 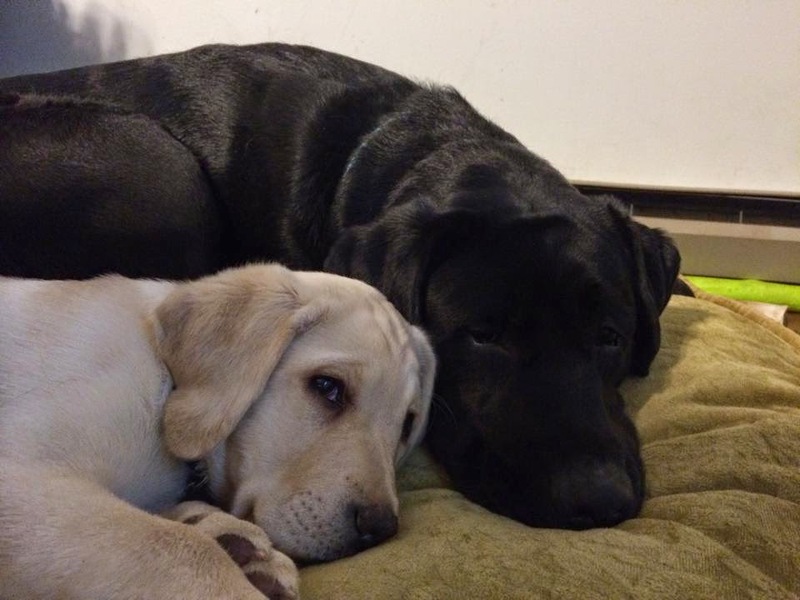 And then a trip to a Team Training and meeting and becoming friends with individuals with service dogs made the hard part of giving the dog up seem not so hard.” Kelly and her daughter Nikki soon became puppy raisers. Together, they have raised Taz, Rizzo, and Drizzle, who were all discharged, and SSD Nitro, who will be going to Team Training with his new partner in February. Becky Lamb, our puppy raiser coordinator, understands what our puppy raisers go through when they raise and give up their puppy. She began raising SSD Scotia in September 2010 as the best way to learn her new job. Scotia went on to become one of our breeders (she was recently retired), and Becky welcomed SSD Bridge (now in advanced training) and now SSD Jade into her home. Our next Team Training, where people receive their new service dog and learn to work together as a team, is coming up on February 2-18. If all continues to go as planned, five dogs will be placed with their new partners. It’s true that when one dog is finishing his journey with his puppy raiser, there are several new puppies who are just beginning. Around that same time that five dogs will be entering Team Training in February, 15 nine-week-old puppies will be just starting their journeys to become service dogs. Wouldn’t you like to take home your own pudgy, wrinkly-faced puppy and help shape him or her into an amazing service dog who will change someone’s life? 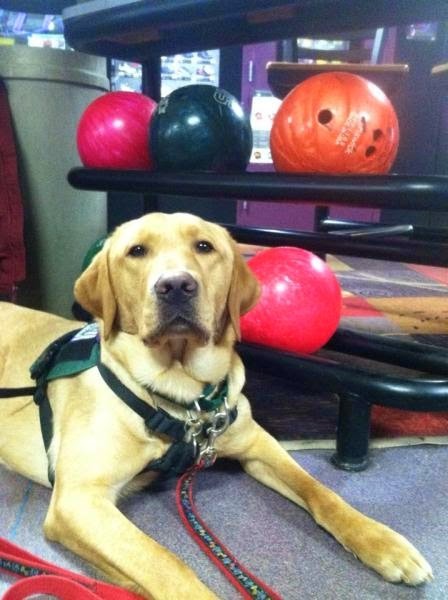 If you would like to raise a future service dog, apply online today or call us at 717-599-5920 to learn more! The thermometer said 24 degrees this morning, but it felt like 7. Brrrrr! We don’t know about you, but we think SSD Breeze has the right idea. It’s time to curl up in a blanket next to the fire! Our dogs are working dogs, though, and that means that they (and their handlers) will be spending some time outside when they go out in public. (And of course, all dogs naturally need to go outside a few times day.) Here are some tips so your dog stays safe this winter. When you come in from outside, it’s a good idea to wipe your dog’s paws, legs, and stomach to remove any salt or antifreeze that may have gotten on them. Both are poisonous to dogs. The chemicals in salt can also burn your dog’s paws or cause them to crack and bleed. You may want to avoid walking your dog through salt. Young puppies are more sensitive to the cold than older dogs. 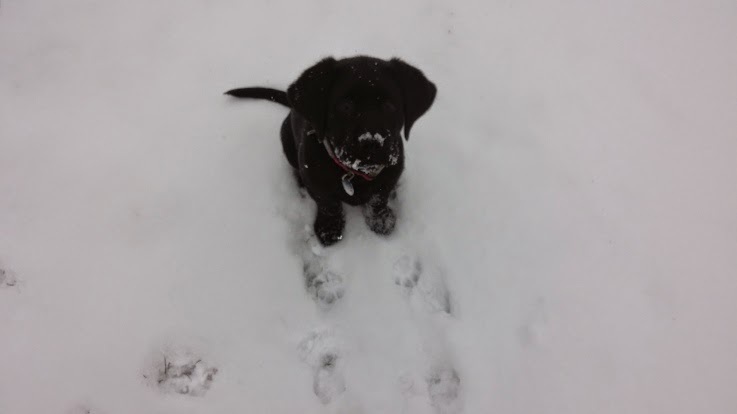 If you have a puppy, you may want to only take short trips outside. If you can’t take your dog in with you, don’t put them in the car. Your vehicle can reach freezing temperatures very quickly. Even if all you’re going to do is run into the grocery store for a gallon of milk, you shouldn’t leave your dog alone in the car. You never know what’s going to happen once you’re inside the store. Any number of things could keep you inside longer than you expected. 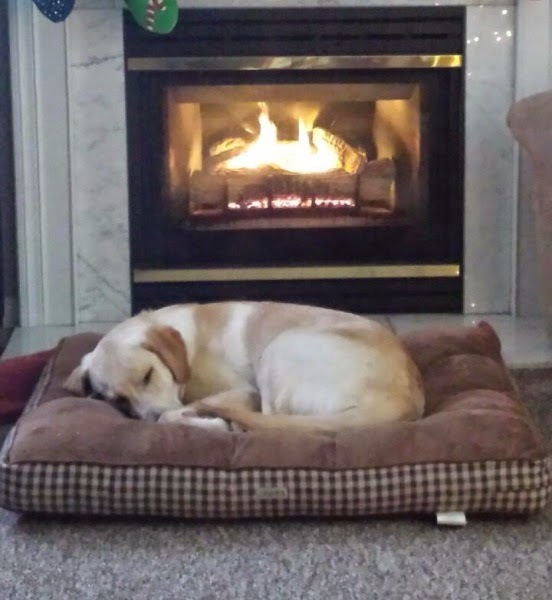 Just like SSD Breeze, give your dog a nice, warm place to sleep that’s away from drafts. 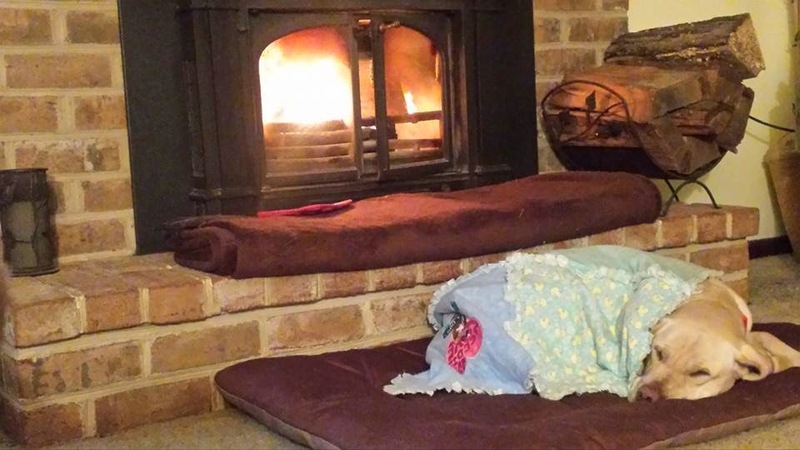 Not all dogs like to be bundled up the way Breeze is, but most dogs like to have a warm, soft place to curl up. Make sure your dog’s tags are secure. The snow can mask scents, and it’s very easy for dogs to lose their way and get lost. Just because it’s cold outside, though, doesn’t mean your dog can’t go outside and play! Our dogs love to romp around, catch snow balls, and bury their faces in the snow! Do you have any other safety tips for cold weather? Leave them in the comments. It’s Farm Show time! The Pennsylvania Farm Show starts on Saturday, January 10. If you’re from Central PA, you’ve probably been counting down the days till you could get a milkshake from the PA Farm Show. This is the largest indoor agricultural exhibit in the United States, and between the animals, produce, competitive exhibits, and vendors, and of course, the butter sculpture, there’s lots to see. And then there’s the food! 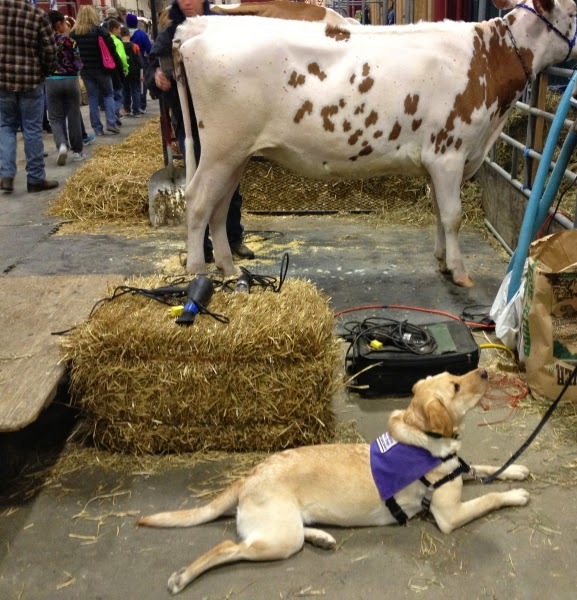 The Farm Show is a great experience for our service dogs in training. We usually take our advanced training dogs at least once. Because there are so many smells, crowds, and food on the floor, it’s a very challenging outing. 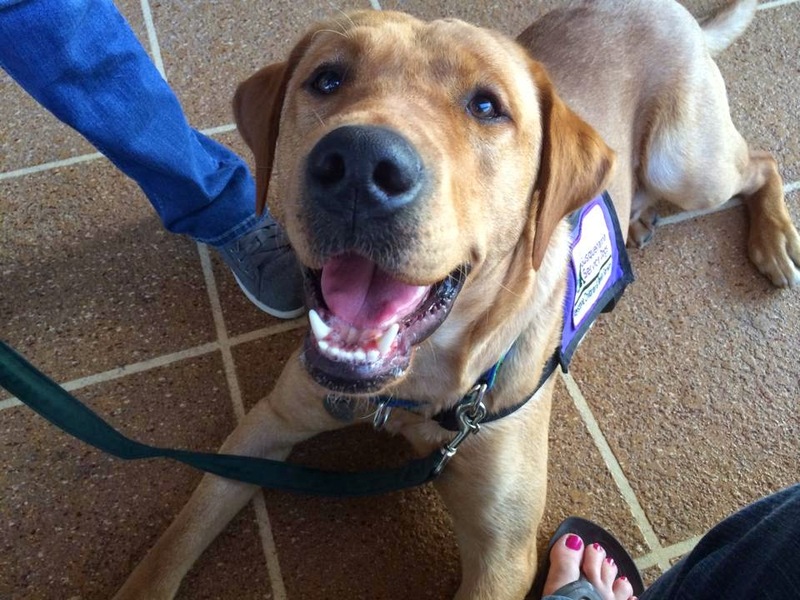 Here are five tips to help you and your service dog in training have a successful trip. 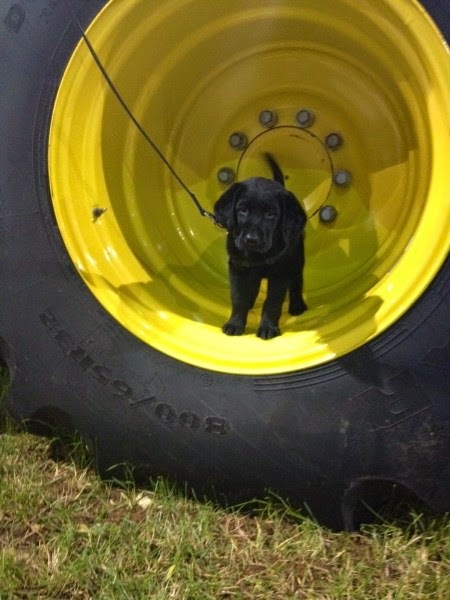 The Farm Show is chock full of things to distract your dog. You’re going to be competing with animals, food, and crowds of people for your dog’s attention. Make sure you pull out all the stops and bring amazing power treats. If your usual power treats are hotdogs, consider bringing something even better, like hamburger, chicken, or leftover steak. You want your dog to say “Wow, I want more of that!” so they stay focused on you instead of trying to vacuum the Food Court floor. The Farm Show is a very challenging outing. While you might want to spend a few hours walking around to see everything, your dog may only be able to handle 30 minutes. Plan to keep your visit short and only stay as long as your dog is being successful. 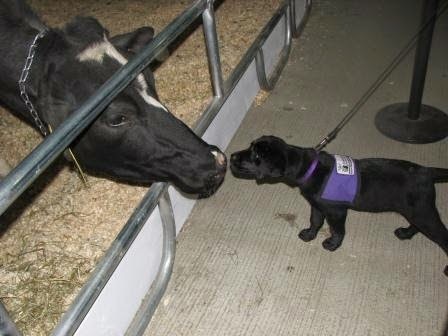 It’s a great experience for your dog to walk through the exhibits of horses, cows, sheep, goats, pigs, and chickens. However, these other animals might not be happy being around your dog. Please keep an eye on the other animals’ reactions to your dog, and if they seem distressed, remove your dog, even if your dog is being perfectly calm. 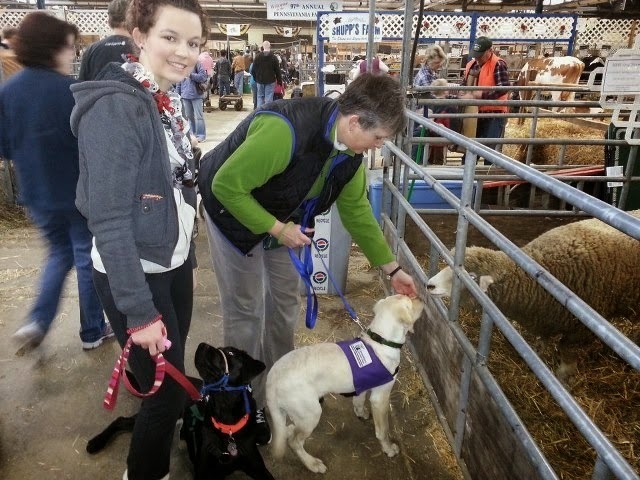 The Farm Show is usually crowded, and many people will want to pet your dog. Don’t be afraid to say no if your dog can’t handle a greeting at that time or if you just want to keep your dog focused on you. Of course, the Farm Show is also a good opportunity to practice greetings if you think your dog will be successful. We said it earlier, but we’ll say it again. The Farm Show is a hard outing. Your dog will not be perfect. Be patient and celebrate the small successes your dog has. 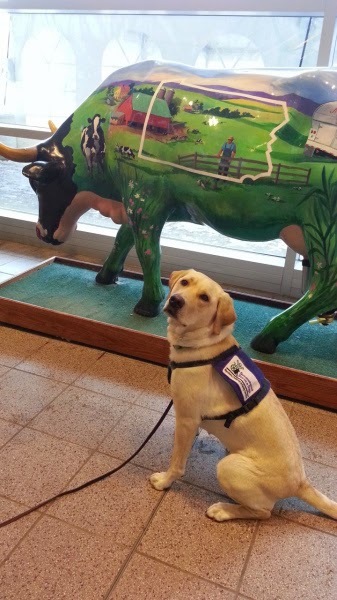 Do you have other tips for navigating the Farm Show with your service dog in training? Leave them in the comments. Have fun and enjoy your Farm Show milkshake!